American Furniture and Artwork | Chinese Export Porcelain | Skinner | Skinner Inc.
BOSTON, MA – February 19, 2014 – A fine selection of American antique furniture and historic art, including a rare Paul Revere, Jr. drawing, in addition to property formerly in the collection of folk art pioneer Edith Halpert, will be offered at Skinner, Inc.’s American Furniture & Decorative Arts Auction on March 2nd. Impressive examples of Chinese export porcelain, mirrors, weathervanes, textiles, pottery, and paintings will also shine in this auction. 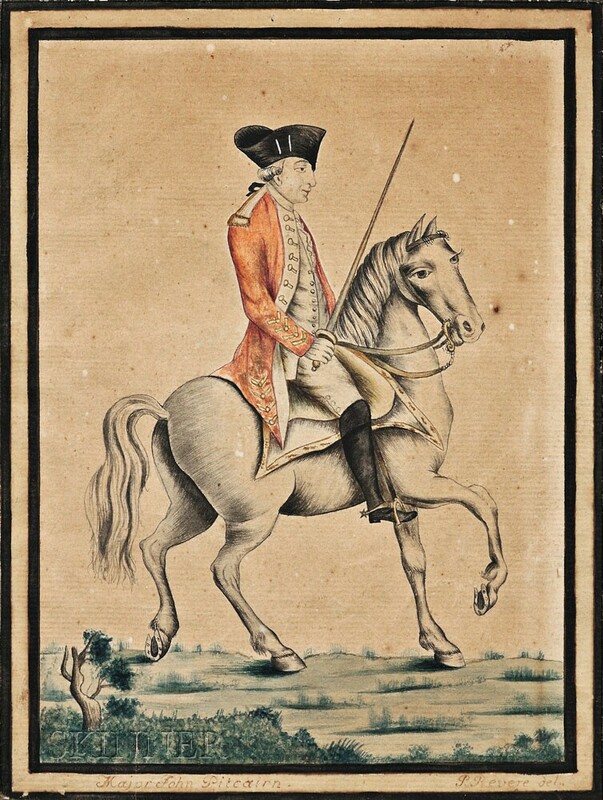 Skinner is pleased to offer an exceptional collection of American artwork, highlighted by Paul Revere, Jr.’s watercolor Portrait of Major John Pitcairn on Horseback (Lot 76, estimated between $20,000 and $30,000). Believed to be a preparatory picture that may have resulted in an engraving, this lot drew the attention of Skinner experts for its scarcity and specificity, capturing the precise details of Pitcairn’s uniform and featuring very fine, carefully drawn lines. Furthermore, the history and significance of Revere’s subject is compelling: Pitcairn stayed at a home in Boston that belonged to Francis Shaw, Paul Revere’s neighbor, when martial law was imposed in the city. According to lore, the locals, including Revere, respected Pitcairn because of his fairness, consideration, and courtesy is settling disputes. It is likely that this small and possibly unique portrait of Major Pitcairn was completed during that time of relative amicability with Paul Revere, before the revolution intervened. Three Framed Watercolor and Calligraphic Pages of a Young Man’s Problem Book are also of note, reportedly executed by Christian Miller while attending Chestnut Hill Seminary in Pennsylvania (Lot 101, $1,000 to $1,500). A number of attractive house portraits also stand out in this sale, several arriving from a private collection from Lewiston, Maine. One such item, Portrait of a House with Green Shutters, signed and dated by George McConnell, offers a glimpse into what was most likely a working farm house in Maine (Lot 275, $1,000 to 1,500). Massachusetts is also beautifully represented in Farmhouse with Green Shutters and Four Figures, the auction’s cover lot, an oil on canvas work by George Frank Higgins (Lot 274, $3,000 to $5,000). 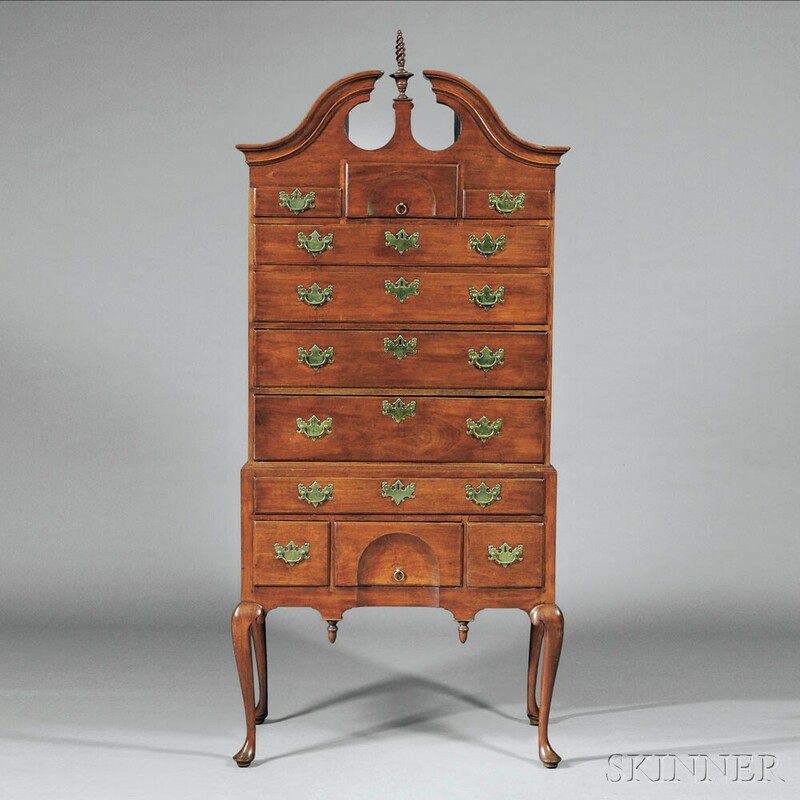 “Skinner is fortunate to be offering a broad representation of the well-designed, quality furniture that was being made in America in the 18th and 19th centuries, from as far south as Baltimore, to as far north as Maine. These works of the cabinetmakers’ art offer the opportunity to enjoy remarkable value at affordable prices,” said Stephen Fletcher, Director of American Furniture and Decorative Arts at Skinner. For a fine example of Rhode Island furniture, the Federal Mahogany Inlaid Demilune Card Table is a museum-quality, neoclassical work that epitomizes the federal period in the Newport area (Lot 72, $1,500 to $2,500). Massachusetts is also represented by an early 18th Century Queen Anne Maple, Walnut, and Walnut Veneer High Chest of Drawers featuring beautifully figured veneers (Lot 17, $5,000 to $10,000), and a Queen Anne Walnut Carved Scroll-top High Chest of Drawers with its likely original handmade brass hardware (Lot 23, $10,000 o $15,000). Evocative of an era in which elaborate, formal dining was custom is a Set of Twelve Federal Carved Mahogany Shield-back Dining Chairs attributed to Thomas Burling or Robert Carter, c. 1790 (Lot 178, $25,000 to 35,000). There is some speculation that George Washington and Thomas Jefferson owned large sets of similar chairs made by Burling. Skinner is presenting a selection of folk art pieces originally owned by renowned modern art dealer Edith Halpert of the American Folk Art Gallery, New York. 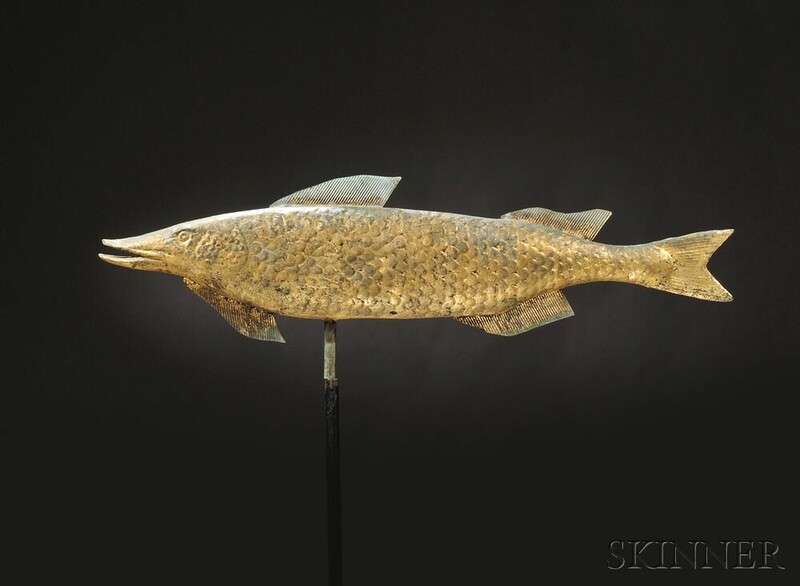 A pioneer and champion of American folk art, Halpert left a legacy of collectibles of considerable charm, including an elegant Molded Gilt Copper Fish Weathervane (Lot 334, $4,000 to $6,000). Further blending art and function, Skinner’s robust selection of weathervanes also includes the sculpture-like, flattened copper Molded Copper Stag Weathervane (Lot 336, $10,000 to $15,000). Another exemplary folk art offering is The Royal Psalmist, a signed and titled watercolor on paper by Lucy Douglass (Lot 127, $30,000 to $50,000). Highlighted by a refreshing splash of bright and beautiful color, this work has a history of exhibition, having been loaned to a number of galleries and institutions, including the Museum of Modern Art. Also sure to please is a Framed Fraktur Birth Certificate (Lot 105, $4,000 to $6,000). An early 19th century watercolor by Rev. Henry Young, this work depicts a young husband and wife with clasped hands and a bouquet of flowers and retains a label from the American Folk Art Gallery, New York. A number of Chinese export porcelain works from the estate of esteemed collector Peter Rosenberg will be available, each showcasing the signature blend of American and Chinese influence. 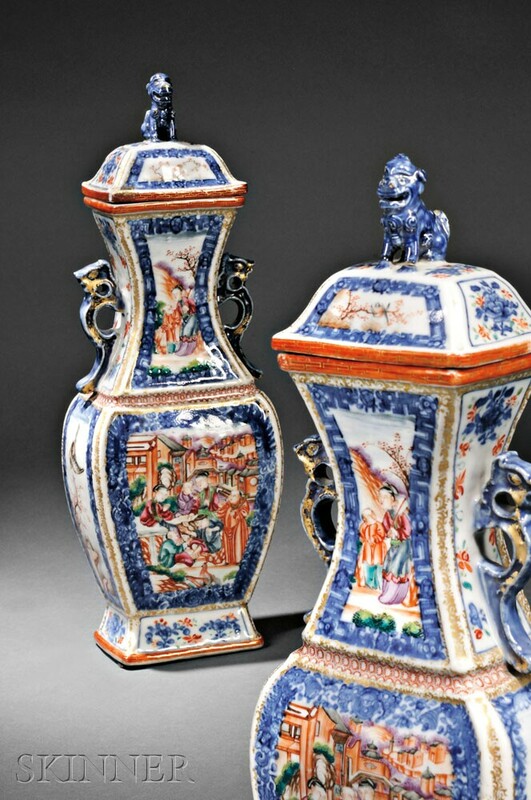 One stellar example is an 18th century Pair of Chinese Export Porcelain Mandarin Palette Covered Garniture Vases (Lot 44, $2,000 to $2,500), decorated with underglazed blue flowers, birds perched on trees, figures in a landscape and dragon figural handles. Additional highlights of fine Chinese export porcelain include a Large Chinese Export Porcelain Punch Bowl (Lot 60, $1,000 to $1,500) and a Pair of Chinese Export Porcelain Rose Mandarin Covered Vegetable Dishes (Lot 49, $800 to $1,200) decorated with Mandarin figures in a courtyard. Collectors can also bid on over 200 lots from the convenience of the internet during Skinner’s online-only Americana auction, taking place February 24 through March 3. Skinner specialists have hand-picked the selection of American pottery, textiles, prints, rugs and carpets as items that can be purchased with ease online. Bidders also have the added value of previewing the online-only lots in person during the regular Boston preview hours. Previews for the auction will be held on Thursday, February 17, from noon to 5 P.M., Friday, February 28, from noon to 8 P.M., and Saturday, March 1, from noon to 5 P.M. Illustrated Catalog #2710B and 2709T is available from the Subscription Department, at 508-970-3240, or from the Gallery. Prices realized will be available online, at www.skinnerinc.com, both during and after the sale. The Skinner website enables users to view every lot in the auctions, leave bids, order catalogs and bid live, in real-time, through SkinnerLive! This entry was posted in News and tagged American furniture, American Furniture & Decorative Arts, american painting, American Revolution, american textiles, Americana, antiques, Chinese export porcelain, decorative arts, Edith Halpert, federal furniture, folk art, fraktur, house portraits, Major Pitcairn, needlework, Paul Revere, Peter Rosenberg, portrait, Queen Anne furniture, Stephen Fletcher, weathervanes by Skinner. Bookmark the permalink.